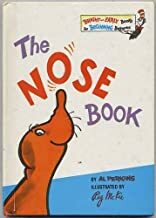 'Everybody grows a nose', and every pre-school child is interested in his own. THE NOSE BOOK looks at a world of noses that are colourful, useful and very jolly. Bright and early books help even the youngest children get ready to read. Simple stories and basic concepts are humorously presented in rhythm and rhyme. Pictures that fully explain the text help even babies make the important connection between word and meaning. It's never too early to find out that 'Learning to read is fun'. About Al Perkins (Author) : Al Perkins is a published adapter, author, and an illustrator of children's books. Some of the published credits of Al Perkins include The Ear Book (Bright & Early Board Books(TM)), Digging-est Dog.